No matter what questions you might have about quizzes, we have the answers! How do I grade a quiz? How can I reuse questions in multiple quizzes? Can I use mathematical formulas in quizzes? I need more information on how the different quiz settings affect quiz behaviour. There are three methods available for adding questions to a quiz on the Edit Lesson screen. You can add a new question, add an existing question, or add a category question(s). Please note that category questions will not appear unless you already have created at least one category under Questions > Categories in your dashboard. This option allows you to select one or more existing questions from the Question Bank and insert them in your quiz. 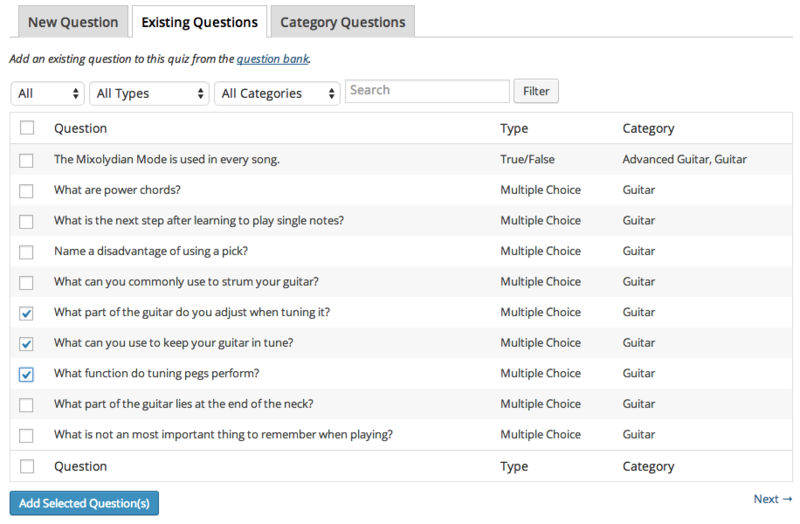 You can search for a question, or filter by question type and question categories, and questions that have/haven’t already been used in a quiz. The panel displays 10 questions per page. Remember that selections are not preserved between pages, so you must select and add questions from one page before moving to the next. This option provides full Question Bank functionality, allowing you to insert a random selection of questions from any question category. Select a category and a number of questions to display, and click Add Questions. You can add multiple groups of category questions if you want to include questions from more than one category in the same quiz. You can also use a mixture of Category Questions and Existing Questions if you want to use randomly selected questions, and you have certain questions that need to be included in the quiz each time. Using the Existing Questions and Category Questions options, it is technically possible to add multiple instances of the same question, but no questions are duplicated on the front-end of your site. Students can also upload files for quiz questions. This gives students the ability to create artwork, documents, video or other types of files as part of a test or to submit as homework. File types allowed are dictated by WordPress. More at: Uploading Files – Types. To remove a question or group of questions from a quiz, click ‘Remove’ next to the question or group of questions. Removing a question from a quiz doesn’t delete it from the Question Bank. To delete a question, you need to go to Questions > All Questions and click the ‘Trash’ link on the question you want to delete. Learners need to achieve a specified passmark before the lesson is completed. If this is not ticked, the passmark is automatically set to 0, and the learner can complete the lesson without passing the quiz. The score needed to pass this quiz. This setting is only visible if “Pass required” is ticked. You can optionally choose to limit how many of this quiz’s questions are displayed each time the quiz is taken. You can also reset all quizzes to display all questions by going to Sensei > Updates and running the ‘Set all quizzes to show all questions’ update. Displays the quizzes questions in different order each time. If your quiz contains only multiple choice, gap fill* or true/false questions, you can have it graded automatically as soon as the learner submits the quiz. This also displays any answer feedback for each question. See Question Bank for more information. This adds a ‘Reset Quiz’ button below the quiz, so learners can take the quiz again if needed. When auto-grading a gap-fill question, the case and leading/trailing spaces are ignored. For example, the following question accepts both “silver” and “Silver” as the correct answer, and also ignores any spaces before and after the given answer. If there is more than one possible answer, or you want to account for common spelling mistakes, you can also add the correct answer as a regular expression.